The videos are best watched in order. Sit back and get inspired by CPT. Although the program is known for it's good user interface there is still a learning curve. These vides will help to make the process as smooth as possible. In this video you will learn how to create a repertoire, adding openings and filling them with moves. You will also learn about transpositions and how Chess Position Trainer handles them even across openings. In this video you will learn how to train new positions of your opening repertoire with Chess Position Trainer. In this video you will learn how to recall positions, which you've already learned. It will also demonstrate the differences between the option "scheduled only" and "oldest first". 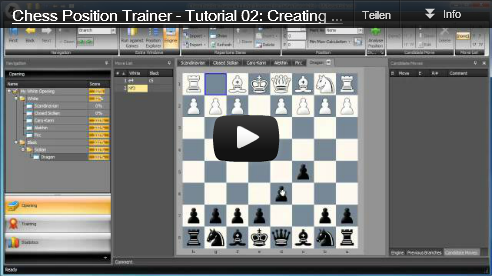 Learn how to use UCI chess engines in Chess Position Trainer to analyze positions. As the tutorial numbers already indicate, there are more videos planned / recorded and I will release them in the future. I want to make you aware of the manual in different languages in case you haven't disovered it yet. Please let me know what you think about the videos. Any suggestions for improvements? Other topics I should cover?